As you can imagine, clothing a tribe of this size was no small feat! 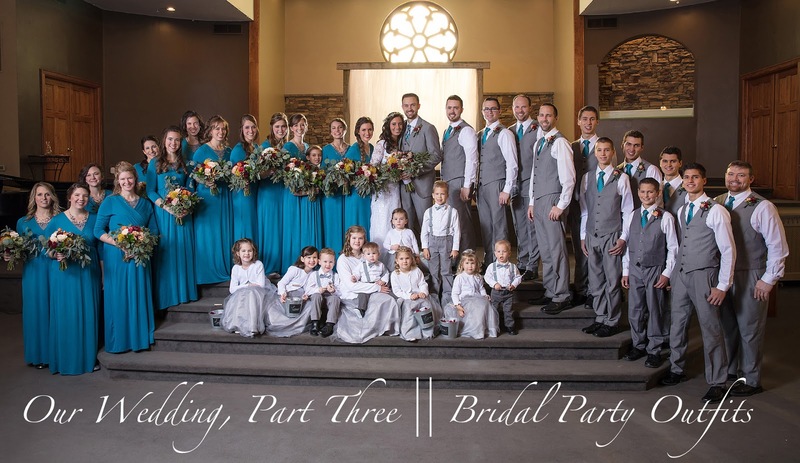 Besides the obvious fact of there just being lots of people, we had little ones (bell ringers + flower girls) ranging in size from 12month to 16, and bridesmaids/groomsmen ranging in size from children's all the way up to adult! 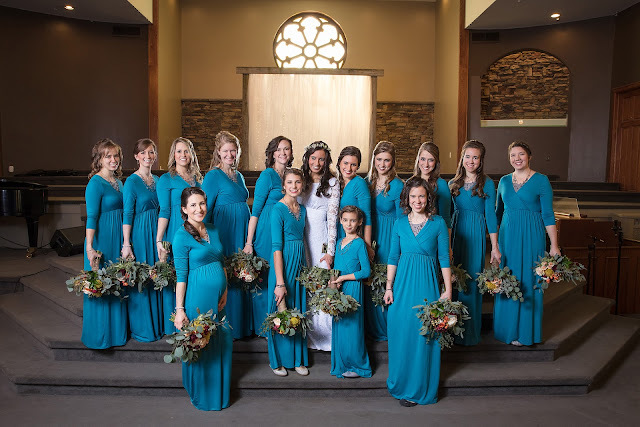 Even the adult sizing was unusual, as three of my bridesmaids were seven months pregnant at the time of our wedding. It was such a fun hunt to find something that worked for everyone! 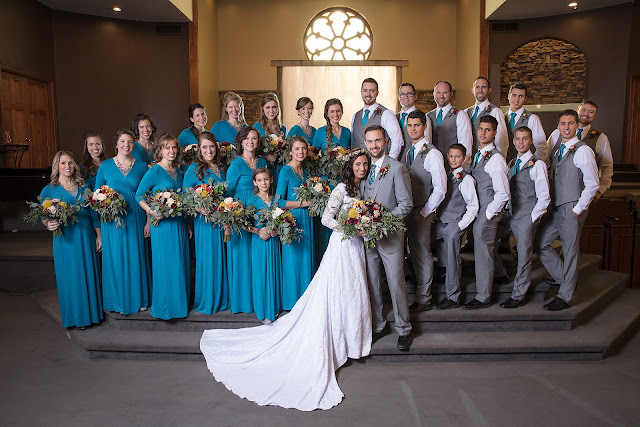 We wouldn't have had our bridal party any other way or size, and I'm excited to share with you today how we came up with the perfect outfits for them to wear on our wedding day. The colors + accents turned out so beautifully! I'll start with the guys first! 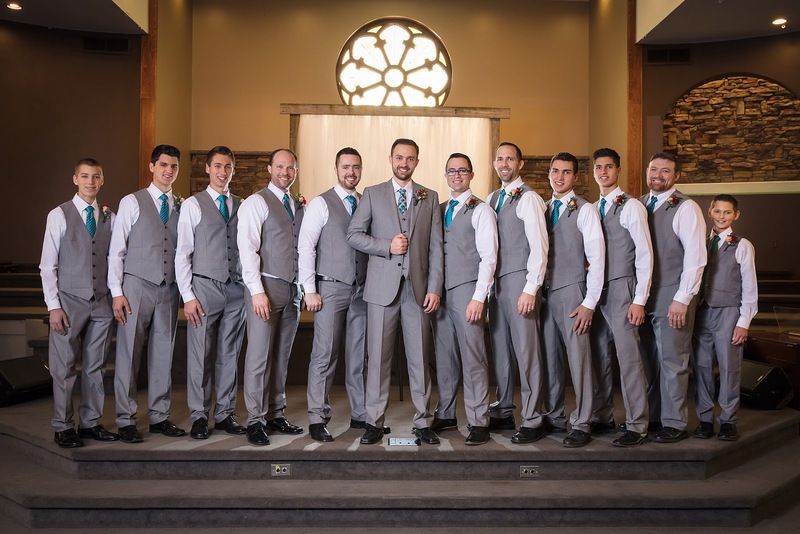 The vests they wore had been the same ones the groomsmen had for my brothers' double wedding, back in September. I loved the cut and fit of those vests and knew it would simplify the purchasing since all of my brothers at least would already have half of their outfits. John's was the same except that I bought him the coat that went with the same set, so that his outfit would be a little different from all of the rest. Groomsmen vests, these JF J Ferrar ones from JCPenny. Groomsmen pants, these JF J Ferrar ones, matching, from JCPenny. John's coat, this JF J Ferrar one, matching, from JCPenny. The store was actually discontinuing this line, plus there was a storewide online promotion going on, so with the combined discounts the pants ended up being about $21 per pair and the vests were around $25. Can't beat those prices! Groomsmen ties, these teal blue ties. I was so thrilled with the groomsmen's ties. I had heard of the Cheap Necktie company through my church, who would order ties in bulk from there for special events. Then Mitch + Bryn also ordered their groomsmen ties from there. The price can't be beat and they were really nice looking ties. Hudson's pants + vest had to be different, since he is in children's sizes. He already had grey pants/vest but they were more of a shiny silver and really didn't coordinate well with the groomsmen's. So I went on a search to find him matching, and ended up with this set from Amazon. He normally wears 12-14 size so I got him size 14 and it was a good fit! It looked so similar to the other guys' sets and I feel like most people wouldn't even know the difference. The ladies outfits were the fun ones! I started searching for these dresses in October and I did not solidify what dress we were going to go with, until Thanksgiving weekend. (hashtag procrastinator yours truly =)) By the time everything was said and done, I had tried eleven different styles from Amazon, and also ordered other dresses from three different boutiques. I really wasn't super picky; I just needed this certain shade of teal blue, with a decent neckline, and stretchy material, and a high waist, and three quarter/long sleeves, in a long length, and in multiple sizes. I sent out an SOS on instragram. Everyone was super helpful but also most of the sites I got referred to were the long, gorgeous, non-stretch styles that were perfect if one wanted to spend $150 per dress but not perfect for what I was wanting. And the boutiques were hard because they didn't offer free shipping for sizing returns. I was back to the Amazon drawing board! **For those who are interested, though, below is a list of the website recommendations I got from people on instagram. (I told some of you ladies that I would share them later!) I wanted to list these because I realized that they could be a big help to another bride reading this who might need ideas! Even though none of them worked for what I was looking for, they might work for you, and are some excellent companies. At the end of the day, the dress I chose for my bridesmaids was this Beachcoco dress in teal blue. I was a little worried about how it would look to have a cami underneath-I really was not interested in a frumpy look and I was pretty concerned about that. I realized that a white cami was not an option-it would stick out to much and just look weird. However, I realized that if I had grey/silver necklaces that had a lot of detail around the neckline, it would layer well on the cami and the necklace would be the focal point, not the camisole neckline underneath. I found grey camisoles at Walmart for $1.64 each! I sewed up the straps a little bit on them and they were good to go. The necklaces I used for my bridesmaids were also the same kind that my sisters and I wore at the double wedding and they were from Walmart as well. And that's the lowdown on the bridal party outfits. 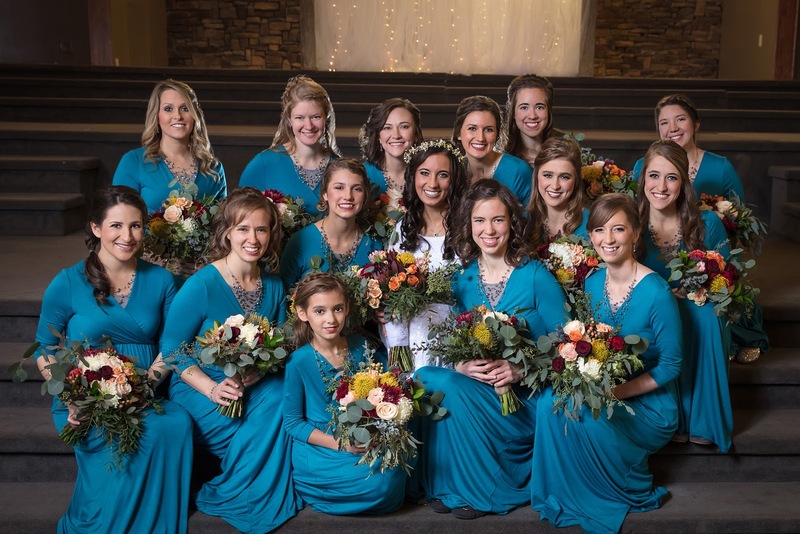 Stay tuned for the next post about how we chose each person in our bridal party! So cute you all look so charming and happy! How is married life going so far? So pretty! It's always fun to hear how colors get chosen. Your bridesmaids dresses remind me of the ones we wore in our women's singing ensemble called Gentle Spirit. 2 of us were pregnant and they had plenty extra material to cover our expanding waistlines. They were a touch more greenyblue than your teal. But everyone looked wonderful in your wedding. I used to be a wedding coordinator at our parish and we used to say more than 5 kids would be like herding cats. Your nieces and nephews looked very well behaved. Yes, the large tribe of littles was quite a project! Several of my brothers + sisters in law practiced with them for quite a while the morning of the wedding, and I would attribute the overall calm of their entrance (smile) to that! There were definitely unexpected elements-like my one nephew who cried + cried through the whole rehearsal (so he ended up being held by his dad (one of the groomsmen) the whole wedding, instead of walking down the aisle with the others. =) And one of the flower girls got sick in the middle of our wedding, poor girl! But thankfully she made it down the aisle okay! 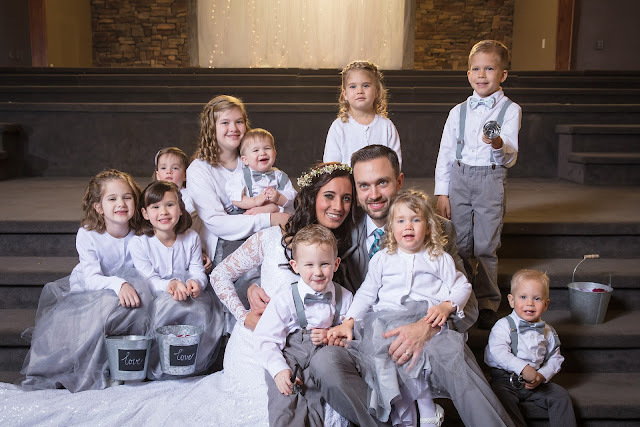 So yes, it was an adventure for sure, but such fun memories to get to have all of my new nieces + nephews be a part of the wedding! Like the outfits! Colours are beautiful. 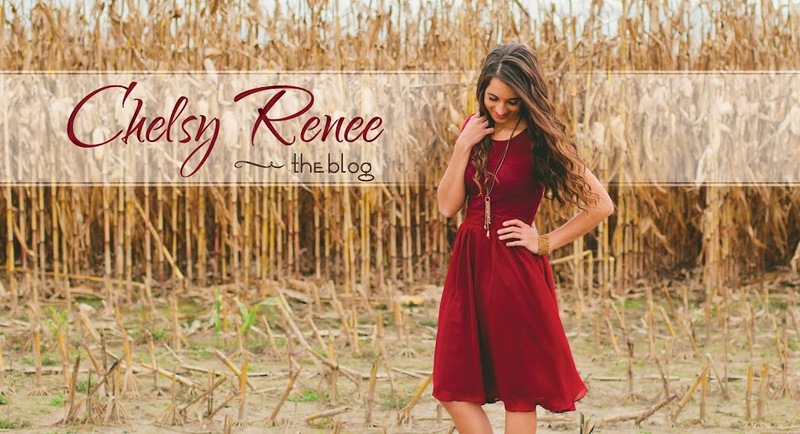 Chelsy, I've been thinking about what a precious gift you are giving to all future brides! How you chose colors, where you looked for clothes, makeup, what works and what doesn't... The candid thoughts and experiences of a new wife looking back on her wedding day! I know it is a load of work to put these posts together, especially with the pictures and all the links. I want to say THANK YOU so much for sharing these posts about your wedding. You didn't have to, but I am so grateful that you did: for the time you have put into these posts and the help that they can be to so many brides. Thank-you so much for your kind words; you are so sweet. That is definitely my heart for this series---to allow a little "inside peek" for those who are interested in hearing, but also to provide helpful information for brides-to-be! I love what you ended up with! I don't know about you, but finding bridesmaid dresses ended up being one of the most challenging aspects of wedding planning for me! Finding something that fit all my ladies + was more modest + was a reasonable price - whew! I didn't even think of amazon at the time, but it seems like that is a great option now! We had our own table. I will be doing a completely separate post all about the reception, later on in this series! Hi chelsy! I enjoy your blog so much even though I'm sure I am not in your 'normal demographics' I am in my mid 50's. LOl. I so admire you and your family. Do you by chance have an Instagram that we can follow as well? Such a lovely post! Praise the Lord for His orchestration of you and John's love story! Very grateful for examples like y'alls! Yes, I do shop at Target! Wow. $46 for a suit like that? I wish I could find a deal like that. Every time I look at suits we are talking hundreds of dollars. The one I had at your wedding cost lots more than $46. That is why it was rare and probably only time you will see me in a suit but did it just for you. Oh, the big search for the right bridesmaid dresses! Which is made even harder by a short engagement like both you and I had. It looks like you found a pretty dress that looked great on everyone. That is amazing that you found such a great option considering all of those factors! I know this is a late comment but since others may look up this post when searching for dresses (which is exactly why I'm here - to send it to a friend! ), I thought I'd mention another website which is where I finally found my bridesmaid dresses. I love these dresses!! In fact as soon as I finished reading this post, I ordered one for myself! I have been looking for a teal dress that didn't cost an arm and a leg for MONTHS!! It wasn't supposed to come until today, but it came on Saturday, so I was able to wear it yesterday for Mothers Day! It sounds like you had an adventure finding it, but thank you for sharing it so others could be blessed with a beautiful new modest dress! !